Monsters University arrives tomorrow on Blu-ray and DVD, and I was provided with a review copy of the Blu-ray + DVD + Digital Copy version. 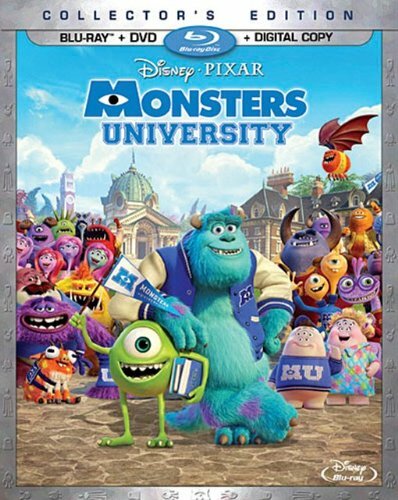 Even though my wife and I both enjoyed the original film, Monsters Inc, we missed this prequel when it was in the theaters so viewing the blu-ray was our first experience with it. Honestly, from the commercials I really wasn't expecting much as it sounded like a story that has been played out too many times before where a group of misfits come together to prove they're just as good as the popular kids. And while that is the general basis of the film, it actually turned out to be quite enjoyable. It had both humor and heart, and an ending which I totally didn't expect. The story goes that ever since monster Mike Wazowski was a little kid he wanted to become a scarer and thus worked very hard to learn everything about it so he could graduate from the Monsters University scarers program. James P. Sulliva, aka Sulley, on the other had comes from a distinguished line of natural scarers and thus never bothered to spend any time studying figuring he'd just be able to breeze through the program. Events then happen which force the two to pair up and join a fraternity of misfit students in order to have any hope of achieving their goal. Many of the voice actors from the first movie return, such as Billy Crystal, John Goodman, Steve Buscemi, John Ratzenberger, and Bonnie Hunt, plus there are new voices such as Nathan Fillion, Sean Hayes, Charlie Day, and Helen Mirren. With that talent and Disney's production values, you know the dubbing was all excellently done and the animation was beautiful. Now, we didn't get to see it in 3D, but I expect that it would have really popped, much like Avatar. This release also comes packed with bonus features such as deleted scenes, a short, behind-the-scenes featurettes, and more. Of course of these are just fillers, like the art gallery, but there's a lot here that's interesting and definitely adds to the value of the release. I've included some video clips to help give you an idea. But yeah, this is a good release and worth picking up.